The Side Mission, Star Crossed/Explore the Local Mysteries, is optional, but it's the only way to access the level's single Crypt. 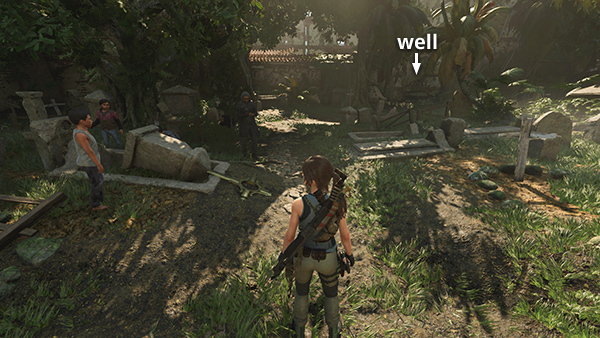 The mission also takes you into one of its two Challenge Tombs and past a number of major collectibles, so this time I've included it as part of the main walkthrough. 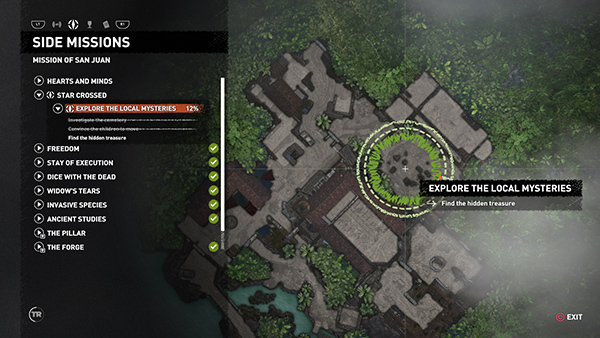 In order to start the Mission, talk to the archaeologist Guillermo, as described at the beginning of the main walkthrough. Then head for the GRAVEYARD at the northeast end of the COURTYARD. Leave Jonah near the LIBRARY entrance and head for the southeast side of the GRAVEYARD. Talk to the herbalist, an older woman standing with a group of children on the southeast side of the GRAVEYARD. (Like other NPCs involved in missions, she glows green in Survival Instinct.) 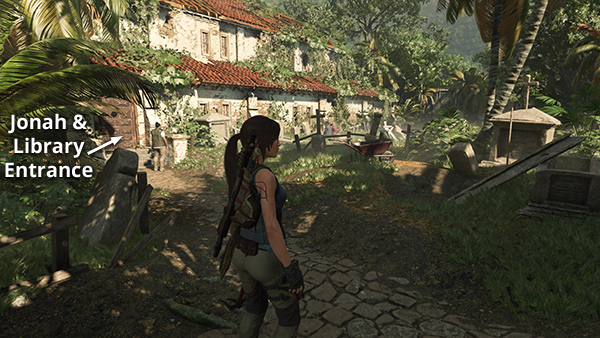 She tells Lara that that Isabela was climbing the cross on one of the gravestones and knocked it over shortly before she disappeared. 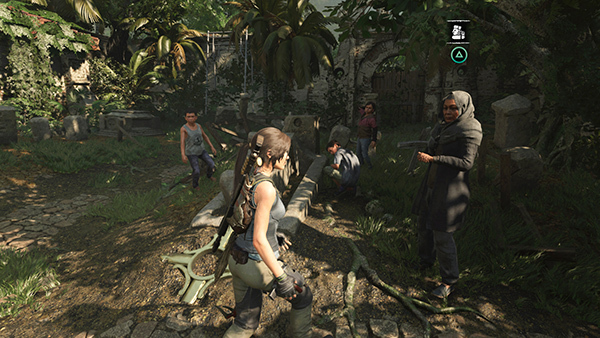 Lara offers to help right the memorial but first she must Convince the Children to Move. Talk to Diego, one of the children standing around the fallen cross. He tells Lara that he and the other kids are looking for treasure that a local storyteller, Manu, told them about and won't leave until they find it. Manu gave the kids a clue in the form of a poem: "I want you to take my supply. I'm nourished when the heavens cry. If I get sick, a village dies. Who am I?" 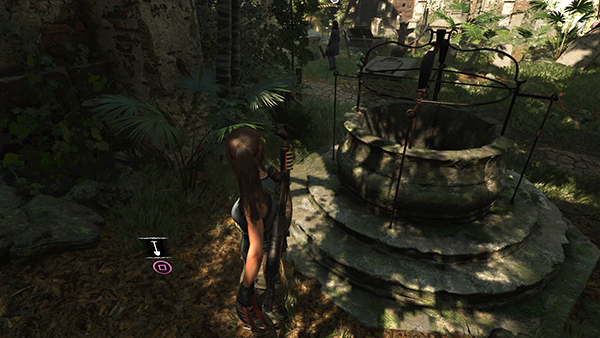 Lara must now Find the Hidden Treasure. 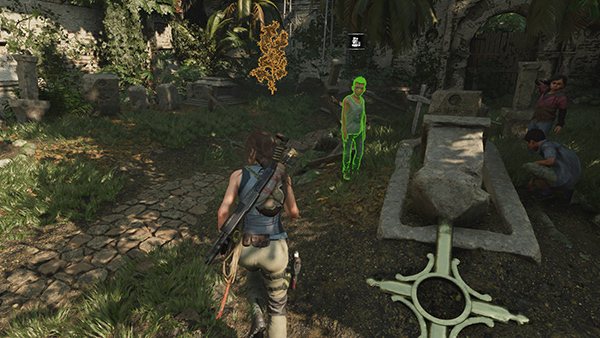 If you check the Mission Screen, you'll see that the treasure can be found somewhere within the GRAVEYARD. And, in fact, there is a covered well about halfway along the southwest wall. 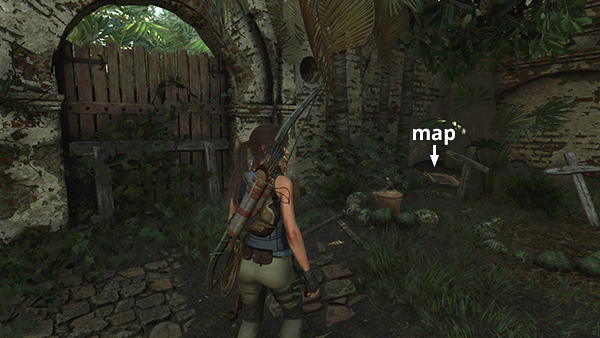 Go behind the well to find the treasure, by digging where you see the survival cache-like icon. Now Return to the Children. When Lara talks to the boy again, he and the other kids run off to show their treasure to Manu. 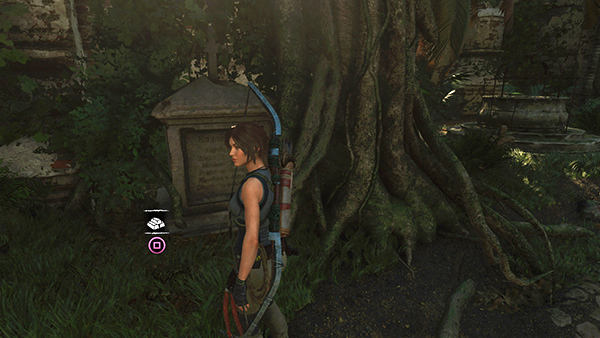 Return to the Woman, who's still standing right next to Lara. 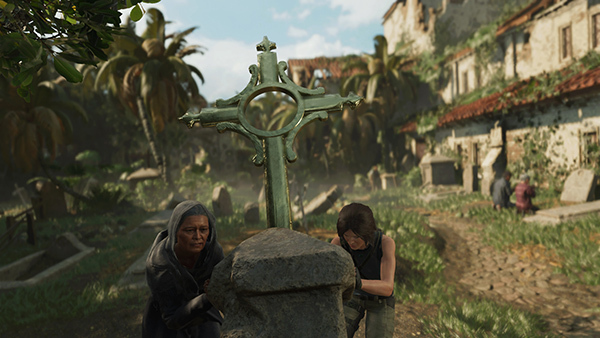 She and Lara raise the heavy gravestone with the cross on top. She says she doesn't know why Isabela was trying to climb it, but maybe it would help to Examine the Cross. Go ahead and do that now to find an inscription: "Look through me to find the way." Your goal is then updated: Follow the Path of Crosses. Before leaving the GRAVEYARD, be sure to pick up a few more collectibles. 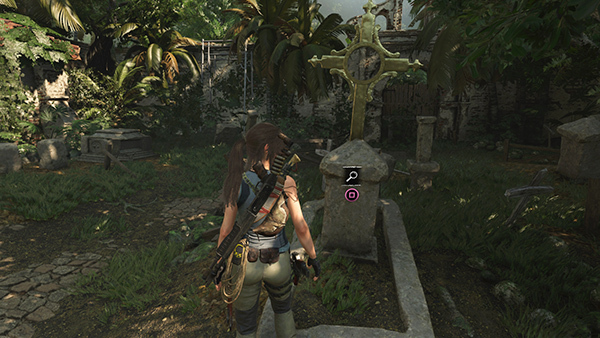 In addition to various crafting resources, there's a relic (1/9), a Slave Collar (Conquerors), sitting next to one of the gravestones near the southeast corner. 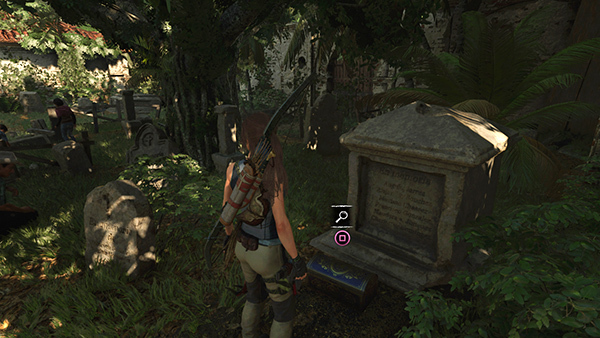 Behind the gravestone with the relic, close to the outer wall, you'll find a resource container and an archivist map (1/4), which reveals the locations of a few documents inside the LIBRARY. We'll get those later. There's also some gold ore sitting next to the gravestone just to the left of the large tree near the well where you found the kids' treasure.